What Does Free Range mean Now? If you have been following the egg industry or consumer trends, you will know that there has been a debate over what a free range egg is for a very long time. The demand for ethically raised pork, chickens and eggs rose so dramatically that the large corporations also wanted a piece of the pie but weren’t prepared to put as much effort as smaller operators had been into producing them. Instead they have applied the usual ‘intensive’ practices that have been the norm within the industry for some time. In Australia, the definition of a free range egg has now been established and the outcome has been disappointing for both producers and consumers. The long battle over who gets to put the words free range on their egg carton, and the new 'information standard' that does not require the hens to actually go outside, has damaged the integrity of the term to the extent that genuine free range farmers have distanced themselves and now call their eggs Pastured. Pastured better defines the production system that free range was originally based on and meets consumer expectations for ethically raised hens. Pastured definition: All livestock are raised outdoors with continuous and unrestricted daytime access to paddocks that are suitable for grazing and are provided with shade and shelter. All animals must use the paddocks each day unless; they choose to shelter because of inclement weather, short term confinement for veterinary treatment or when giving birth. Feed supplements are available to ensure all their nutritional needs are met. Animals are kept at a stocking intensity that will ensure forage is always available in an actively managed rotational grazing system. Pigs are incredibly intelligent and social animals specially equipped to roam and forage on the land. Chickens are decedents of jungle fowl and we believe that pigs and poultry deserve better than a life of confinement. If the definition above fits nicely with your perceptions of what free range should look like, then we are united on the meaning of pastured free range. 'Bred Free Range', Outdoor Bred', Outdoor bred, Raised indoors on Straw', 'Born and Bred Free Range'? These terms do not mean that the pigs are free range. All these terms mean is that only the sow lives outdoors and that her piglets are weaned as early as 21 days of age and moved indoors into sheds or what the industry likes to refer to as eco shelters. The pork produced from bred free range or outdoor bred is not free range. The pigs that the pork comes from were raised indoors, not outdoors on pasture. To be sure you are buying genuine pastured free range pork, look for farms that use pastured based systems and allow their animals to graze freely in the open for their entire lives. 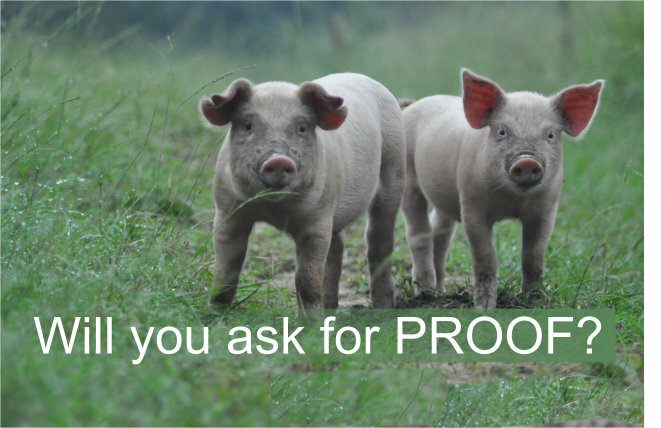 Ask for PROOF to ensure that it is pastured!